We now try the software and test all peripherals if everything is OK will proceed with production, but we overall are very proud that managed to shrink in this space the complete board i only 6 Layers. We learned our lessons from the first H3-OLinuXino prototypes, now this board consumes less power, DDR3L memory is used at lower voltage 1.35V and this helps the processor to not overheat like on our first proto. Where this board could be used? Due to the high integration of H3 SoC the price will be below the price of LIME, but no SATA and LiPo charger. This design is made with Eagle, we have to make few more improvements before run production and put them on Github. * Is H3 faster than A20 (using single or dual core)? * Will you provide a more memory model (1G-2G)? Have you measured the idle/normal/top power consumption? Hi Luca. I work with Banana Pi A20 and Orange Pi H3 boards. H3 is very sppeedly.. When running at the same clockspeed then single threaded performance of H3 is a bit lower compared to A20. But H3 has twice as much cores (good when your workload makes use of many processes) and it can be clocked up to 1.3GHz safely _if_ core voltage can be set high enough. Since Olimex is still experimenting we simply don’t know how fast H3-OLinuXino-NANO can be clocked. Simple benchmark: “sysbench –test=cpu –cpu-max-prime=20000 run –num-threads=4”. On Orange Pi PC with 672MHz DRAM clockspeed you get at different cpufreq settings something like this when using all 4 cores: 912MHz: 202.8 sec., 1008MHz: 183.5 sec., 1104MHz: 167.5 sec., 1200MHz: 154 sec., 1296MHz: 142.5 sec. 2) If it isn’t a case, one can downclock it a bit. And it can be good idea for systems meant to run more or less unsupervised, under arbitrary environment, so e.g. during hot summer it does not locks up, etc. It is a good idea to have some margins, and these china oversellers are clearly prefer to declare superb values isntead. One just have to take it into account. Since I can not spot anything on the pictures and no material is published on Github: do you use any voltage regulator to adjust the SoC’s Vcore voltage (eg. between 1.04V and 1.4V)? Just to get an idea how high CPU clockspeed might be increased: which core voltage did you choose? 1.2V? A SOM for the H3 would be really terrific! Considering the options and pricing, the A13 is OK but has no ethernet, the RT5350 has ethernet (with PHY) and is cheap but has only limited memory and connectivity (lots of ethernet and wireless but only 1x USB host for example). The A20 has everything you need but is therefore also a bit expensive (relatively; 40+ Euros VS 20- Euros for the others). I could really think of some interesting designs based on a H3 SOM with its embedded 100mbps PHY and the 4x USB host that the H3 has! Any idea when we can expect these designs in github? Another great project ! looking forward to it ! it would be rude to ask but how will it be different then existing H3 boards like the Orange Pi ? This form factor really neat. Hopefully it would come with equally neat price, so here be dragons, uhm, I mean IoT and somesuch, everywhere :). Lite/stripped down SoM could be nice as well. Yes, it may take a long time until hardware acceleration for 3D graphics and HD video decoding works with the mainline kernel. But if you don’t mind using the Allwinner’s 3.4 kernel, then both 3D acceleration and hardware accelerated video decoding is usable. Any chance for a version with eMMC? How would I go about using UEXT modules with this board? Maybe route the signals to the headers in a configuration resembling UEXT (just in the smaller pin size)? Is it possible to connect GPIO to an adapter like in the A20 Lime2? Very good news, With 5 or 10 pcs can we build min data center. Things based on A20 are better for microserver/NAS-like storages/etc – due to “native” SATA, allowing one to attach a reasonable HDD/SSD with sane IOPS/speed and native Gigabit ethernet. While it would not do full gigabit, it still can give quite some networking. Sorry, but usb-to-sata bridges and somesuch are much worse. And if you’re serious about e.g. FTP-like use, you do not want slow and troublesome storage, right? Make one that fits into a form factor of a wall adaptor and you’ve got something there. I remembered 16 is the norm with the memory you use, sorry. Thank you for providing open source hardware. I really hope people realize the value of this because unlike some other popular linux boards, these can be used to make actual working products that are viable for mass production. Is it possible to power the board via one of the GPIO-Pins or are there some other 5V/GND Pins where i could connect a external DC-plug style power supply? Is the OTG power limited to the USB standard or can it draw more if needed? @LIME-fan: I don’t know whether there are additional pins or test points for DC-IN but since H3 has no support for a PMIC it seems obvious that DC-IN is just routed directly to USB/HDMI and that for the other voltages fixed voltage regulators are used. Based on the picture above it seems also Olimex is using Micro USB (I really hate it) and if that’s true it will be close to impossible to inject more than 2W (1.8 max. by specs). I would suspect that 5V/GND from the OTG receptacle are used for DC-IN and RX, TX and the ID pin are routed to H3? Any chance that you will have working HDMI-CEC driver? Does it have two UARTs? I’ve been looking for a small but powerful Linux SBC that has two UARTs and so far only the option is the Odroid C1+, it’d be great if there were more options. IIRC the beaglebone has multiple UARTs available on its expansion headers, but I could be wrong. Hi, LIME A20 has 7 UARTS, we have been using 4 of them with success with Ubuntu. Just what I was looking for, I’m willing to buy 1,000. Could you write to me? – Is the only power input via the USB OTG (ackward for embedded projects) or is there another way (GPIO, barrel, header, etc)? What are the power requirements (2Amps)? – Does any one have a GPIO table with pin description? How many UARTS are available for general use? Hi, excellent, seems a great board comming up. Can you please just let me know the number of usable UARTS on the GPIO? Does the H3 processor have analog audio outputs capable of directly driving headphones? Maybe it takes USB into account? Each port means there’er 5V 500mA extra to consider. When we can expect release date ? Nice! This made my day! So cute! So small! I have iMX233-MICRO and had LIME but sold as I was planning to buy Pi Zero. But now is clear I will buy H3-Nano! Any plans for 4GB RAM model in future? do you plan interfacing an LCD display to GPIO-1/2 as you have options in your Lime series? Thank you. I already ordered a pcduino8-uno running an H8-octacore at 1.8 GHz. It’s very interesting, but suffers a lot from overheating causing it to be heavily throttled. I would love to see a small design like the H3 OLinuXino nano with an H8. The problem we’re always seeing is that the CPU is put on the top of the board, making it hard to cool it down, especially when you need a large heatsink. A board designed with the CPU at the bottom would simply have to be screwed against an aluminium plate to serve as a heatsink. This would make it much easier to cool down and spread the heat into the enclosure or the ground if it’s just an open-case design. But as for releasing boards: those who mess with software neeed some HW to chew on. Not like if one can test HW-dependent SW parts on emulator or something. It have to be real HW. And Allwinner’s documents are, erm, something. @LinuxUser Regarding the availability of Allwinner H3 devices, you can buy an Orange Pi PC board right now and start developing/testing software on it. The same software should work on the H3-OLinuXino-NANO too, maybe with some minimal changes. AFAIK the majority of linux-sunxi developers doing the mainlining work for Allwinner H3 have Orange Pi PC boards. Does it have I2S on the connector header? Any update for this project? It has been almost half a year since this post but there does not seem to be any progress on the H3 board(s). Can you give us an update? You also replied to ‘jdh2550’ about a more ‘SOM’ like board. Are you going to release this? I am still looking for a A13-SOM alternative that has Ethernet (and a good price). Today I ordered the NanoPI NEO. 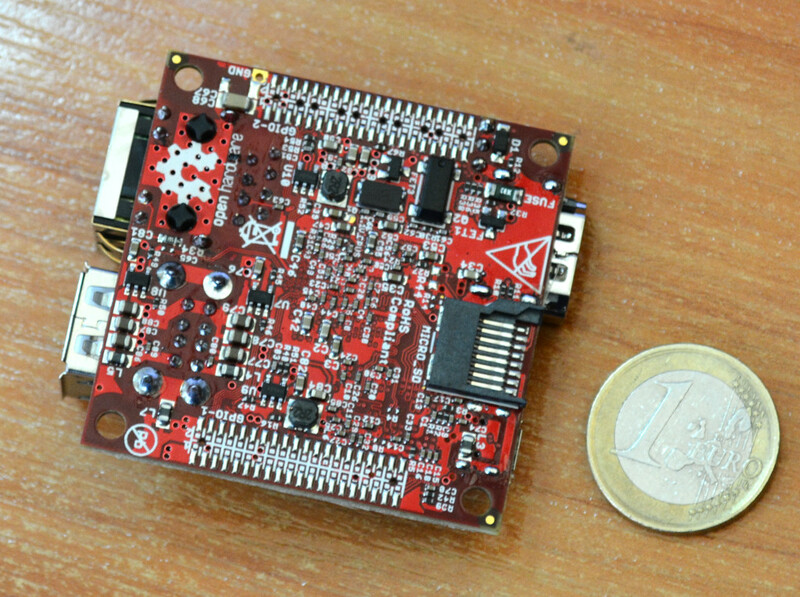 Somewhere between this 50×50 H3 Olimex board and a SOM: http://www.friendlyarm.com/index.php?route=product/product&path=69&product_id=132 and a very good pricetag! Some months ago, I knew from Olimex that “H3 processor is not good for reliable products, it overheats to 50-60C under normal ambient temperature 20C”… Unless Allwinner changes manufacturing process for H3 or reviews H3 itself, I guess we must rule out this product for reliable solutions. If H3 is overheating too much it’s most probably caused by broken settings. That was the case in the beginning with Orange Pis where 3rd parties provided OS images that insanely overvolted the SoC (1.5V — absolute maximum according to specs is 1.4V and for normal use cases 1.32V is enough to let H3 run reliably at 1296MHz). And FriendlyARM made a mistake when releasing their NanoPi M1 encoding the dvfs settings wrong so that H3 there didn’t switched between 1.1V and 1.3V but remained at the latter voltage all the time. At least the various larger Orange Pis run pretty stable at 1296MHz and do not throttle that much if used together with a cheap heatsink (it seems the PCB contains copper layers that spread the heat away from the SoC since components all over the board get warm). But they use a programmable voltage regulator able to adjust VDD_CPUX in 20 mV steps which helps a lot when it’s about to choose whether the device should run at high speed or stay cool. we didn’t saw yet board with H3 which do not heats below 50-60C at 20-24C ambient temperature, what are your observations? what happens when you run stress test on H3 board? We (linux-sunxi devs and Armbian team) did some extensive testing a while ago (first for Pine64 then partially relying on that with H3 boards) trying to optimize THS/throttling settings. We use cpuburn-a7 (worst case scenario if it’s about generating heat through CPU cores — with our new sun8i kernel and Mali400 clocked at 600 MHz we’re able to generate more heat only using ssvb’s lima-memtester). Summing up the experiences with a few H3 devices: The large Orange Pis using DDR3L DRAM and the SY8106A voltage generator (adjustable in 20mV steps through I2C) perform the best (read as: throttle down less), the smaller OPi One/Lite heat up a little more (and throttling isn’t that efficient since the voltage regulator here switches only between 1.1V and 1.3V), NanoPi M1 heats up way more and Beelink X2 and Banana Pi M2+ even more (both not switching VDD_CPUX at all and feeding H3 with 1.3V all the time). It seems Xunlong’s recipe to keep temperatures low are copper layers inside the PCB spreading the heat accross the whole PCB. I thought it would also be related to DRAM type but it’s not (that much) since OPi One/Lite also use DDR3 @ 1.5V. According to the datasheet H3 is specified to run at up to 125°C — In Armbian we start to throttle way earlier and keep 105°C as shutdown temperature (using legacy kernel if this temperature will be reached a shutdown is initiated). It should be noted that thermal readouts differ between OS images that rely on mainline u-boot (like Armbian does) and the outdated u-boot Allwinner provides in the BSP (2011.09). I tested running an Armbian image with the old 2011.09 u-boot and got ~10°C higher internal readouts (no idea why but we kept that in mind when defining the throttling settings). And people who fear running a H3 constantly above 50°C (why not? This isn’t A10 any longer) can rather easily adjust the settings: not by limiting cpufreq but simply by adjusting the so called ths_para section in the fex file (and later with mainline kernel the specific device tree nodes) so single threaded performance is still high while throttling jumping in pretty early to keep temperatures low when more than one CPU cores is busy. Have you already decided how you define VDD_CPUX for your H3 boards? Since this will determine maximum (reliable) clockspeeds anyway. And then by choosing sane throttling settings (read as: do not use Allwinner’s defaults or the settings popular with Orange Pi OS images last year!) you’re done. Additional note: I assumed you are using a fixed 1100mV VDD_CPUX on the H3 NANO and therefore 816MHz is maximum cpufreq for industrial applications. By simply tweaking the relevant sections in the fex file — see http://pastebin.com/waKZzpbW — 816MHz is the upper limit and a thermal limit of 90°C is defined. I don’t care so much about the speed or having 4 cores. The A13 is more than enough for our needs but the H3 has more USB hosts, more UARTs and Ethernet which is not on the A13 at all. I have added the 10 (MOD-ENC28J60) and 10/100 (MOD-ENC624J600) Microchip SPI Ethernet devices to the A13 and although it works fine, the speed is rather low. Even the 10/100 can only be accessed over SPI at a max of 14MHz. Therefore a H3 SOM would be a better fit than the A13, still compact and probably a better price than the A20 SOM. If CPU clockspeed is no concern at all, then H3 is still a pretty good choice. If Olimex would use eg. 1100mV as VDD_CPUX voltage then according to Allwinner H3 can be clocked with 816 MHz max (at Armbian we did extensive testing and found 912 MHz to be reliable too — but Olimex’ customers might better keep some safety headroom for industrial applications). In such a case the following fex could be used: http://pastebin.com/113cYC5Z (limiting max. cpufreq to 816 MHz, starting to throttle at 65°C with 83°C as maximum). Without USB consumers and stuff like that with these settings it’s not possible to exceed 3W consumption even with 400% CPU utilization. And by simply adjusting cooler_table and exchanging 4 with 2 in the middle row H3 will be forced to be a dual-core SoC further lowering consumption and heat emissions. @Tsvetan: Simply try it out, get any Armbian H3 image (eg. http://www.armbian.com/banana-pi-m2-plus/), use fex2bin and the aforementioned fex file to overwrite /boot/script.bin and enjoy your H3-OLinuXino without overheating. At 648 MHz H3 is still a lot faster than A20 when workloads are multithreaded but consumption won’t exceed 2.5-3W and I doubt throttling is an issue at all (due to core voltage remaining at 1040mV). The higher VDD_CPUX is configured through the resistor value the higher the clockspeed can be increased and the earlier throttling will happen (that’s not an issue since it simply prevents overheating by adjusting clockspeeds and active CPU cores as last resort — only Allwinner’s THS defaults are somewhat strange since killing CPU cores is preferred over throttling and killed cores never come back, we fixed the latter in Armbian’s sun8i kernel already). So Olimex could provide eg. 3 NANO variants with different resistor values (or allow the customer to choose the value via jumpers or something like this) allowing 648MHz @ 1040mV, 1008 MHz @ 1200mV and 1296MHz @ 1340mV, the first showing no throttling issues and minimal consumption, the last good for highest performance at higher consumption (with some performance degradation due to throttling after a few minutes running heavy workloads depending on heatsink/fan used) and the middle in between. I wonder why not just to use SY8106A which is fairly small/cheap yet one could set default voltage using resistors and then change it using I2C, according to http://linux-sunxi.org/SY8106A – it even supported in mainline kernel already as far as I know. So one could get DVFS, sort of. As far as I can see the project is totally abandoned. I try to develop my own board with the H3 processor as a hobby project. I’ve downloaded your schematics and pcb. Everything seems to be clear except of the pcb stack up. It is important for the memory trace impedance. Can I get any information regarding copper thickness, plating thickness and prepreg thickness? All memory vendors recommend 40 Ohm traces but with your design it seems that impedance is about 60 Ohm. Am I right? Thank you for opensource files! I learned a lot having a look at them. On the Github there is only the files for the H3-olinuxino, not for the H3-olinuxino-nano. I read that you made some improvement for heat problem with the nano that can be made in the normal size too. Are the files in the github been corrected with the heat issue? Are the nano files available too? I would like to develop a H3 pcb as a hobby.